Justice Minister says that, as of June 1, government bills may no longer exclude residents of Judea and Samaria. Justice Minister Ayelet Shaked (Jewish Home) and Tourism Minister Yariv Levin (Likud), who are leading a proposal to apply Israeli law in Judea and Samaria just as it is applied in the rest of Israel were present today at a meeting on the subject in honor of the 50th anniversary of the 6-Day War at the Knesset Committee. 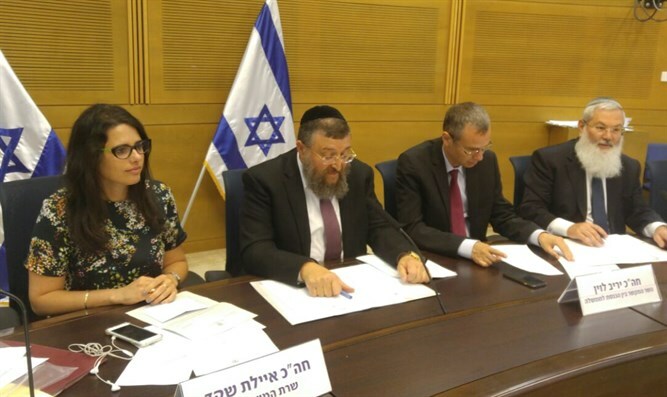 Levin and Shaked, who jointly lead the Legislation Committee, notified the rest of the government ministers that, as of June 1, every governmental bill will relate to Judea and Samaria along with the rest of Israel. “What goes on within the realm of the General’s Order is a disgrace and a scandal, and an expression of the discriminatory and abusive manner shown to settlement and the settlers of Judea and Samaria in complete contradiction to government policy. The time has come for the system to stop pursuing small plots and focus more on applying the law to the residents. The selectivity has got to end. “We have waited 50 years and now is the time to change our approach - the law will apply in Judea and Samaria, and only if there is a special reason that it should be otherwise - it will be explained and examined,” he emphasized. Shaked explained during the meeting, “We are trying to change the legislative reality in the Knesset. Minister Levin and I instructed the Ministers that, as of June 1, every governmental bill will relate to the residents of Judea and Samaria, whether in primary legislation or via General’s Order or some other way. “From a check we held in the last Knesset, we saw that, aside from the known Regulation Law, only four laws addressed Judea and Samaria residents: “the Foster Law, the Civil Service Law, the Economic Efficiency Law, and the Prohibition of Discrimination in Products Law.